10 Finally, be strong in the Lord and in his mighty power. 11 Put on the full armor of God, so that you can take your stand against the devil’s schemes. 12 For our struggle is not against flesh and blood, but against the rulers, against the authorities, against the powers of this dark world and against the spiritual forces of evil in the heavenly realms. 13 Therefore put on the full armor of God, so that when the day of evil comes, you may be able to stand your ground, and after you have done everything, to stand. 14Stand firm then, with the belt of truth buckled around your waist, with the breastplate of righteousness in place, 15 and with your feet fitted with the readiness that comes from the gospel of peace. 16 In addition to all this, take up the shield of faith, with which you can extinguish all the flaming arrows of the evil one. 17 Take the helmet of salvation and the sword of the Spirit, which is the word of God. New Beginning Baptist Church will be having a Yard Sale this Saturday, August 20th at 7am. ALL proceeds from the yard sale will help fund our FREE community dinner, God's Dinner Bell. Items to expect include but are not limited to; cloths, household items, oil company signs, wedding and Christmas decoration, etc. Pork chops and hot dogs will be sold starting at 10am. Come out and visit us at 200 Clermont Drive, Bardstown, KY 40004, (502) 233-1352. New Beginning Baptist Church is making our first ever cook book to fund our free community meal. If anyone has some delicious recipes they wouldn’t mind sharing with us; that would be awesome. Also, feel free to include any tips or stories/memories about the recipes to personalize the recipe. 18 Paul stayed on in Corinth for some time. Then he left the brothers and sisters and sailed for Syria, accompanied by Priscilla and Aquila. Before he sailed, he had his hair cut off at Cenchreae because of a vow he had taken. 19 They arrived at Ephesus, where Paul left Priscilla and Aquila. He himself went into the synagogue and reasoned with the Jews. 20When they asked him to spend more time with them, he declined. 21 But as he left, he promised, “I will come back if it is God’s will.” Then he set sail from Ephesus. 22 When he landed at Caesarea, he went up to Jerusalem and greeted the church and then went down to Antioch. 43 “No good tree bears bad fruit, nor does a bad tree bear good fruit. 44 Each tree is recognized by its own fruit. People do not pick figs from thornbushes, or grapes from briers.45 A good man brings good things out of the good stored up in his heart, and an evil man brings evil things out of the evil stored up in his heart. For the mouth speaks what the heart is full of. 1 Brothers and sisters, my heart’s desire and prayer to God for the Israelites is that they may be saved. 2 For I can testify about them that they are zealous for God, but their zeal is not based on knowledge. 3 Since they did not know the righteousness of God and sought to establish their own, they did not submit to God’s righteousness. 4 Christ is the culmination of the law so that there may be righteousness for everyone who believes. 14 For those who are led by the Spirit of God are the children of God. 15 The Spirit you received does not make you slaves, so that you live in fear again; rather, the Spirit you received brought about your adoption to sonship. [a] And by him we cry, “Abba,[b] Father.” 16The Spirit himself testifies with our spirit that we are God’s children. 17 Now if we are children, then we are heirs—heirs of God and co-heirs with Christ, if indeed we share in his sufferings in order that we may also share in his glory. New Beginning Baptist Church will be hosting Vacation Bible School (VBS) this week. So what exaclty is VBS? Vacation Bible School is a form of religious education which focuses on children. VBS is open to all preschool to 8th grade kids. Our theme this year is Big Apple Adventure (think New York City). VBS will run from 6:30PM to 8:30PM until Friday June 24th. We can provide transportation to anyone in need of it, just give us a call at (502) 233-1352 and we can make arrangements. We've had a pretty good turn out so far but the more definitely the merrier. 1 I urge, then, first of all, that petitions, prayers, intercession and thanksgiving be made for all people— 2 for kings and all those in authority, that we may live peaceful and quiet lives in all godliness and holiness. 3 This is good, and pleases God our Savior, 4 who wants all people to be saved and to come to a knowledge of the truth. 5 For there is one God and one mediator between God and mankind, the man Christ Jesus, 6 who gave himself as a ransom for all people. This has now been witnessed to at the proper time. 7 And for this purpose I was appointed a herald and an apostle—I am telling the truth, I am not lying—and a true and faithful teacher of the Gentiles. 8 Therefore I want the men everywhere to pray, lifting up holy hands without anger or disputing. 1Now there was a certain man from (A)Ramathaim-zophim from the (B)hill country of Ephraim, and his name was (C)Elkanah the son of Jeroham, the son of Elihu, the son of Tohu, the son of Zuph, an Ephraimite. 2He had (D)two wives: the name of one was (E)Hannah and the name of the other Peninnah; and Peninnah had children, but Hannah had no children. 3Now this man would go up from his city (F)yearly (G)to worship and to sacrifice to the LORD of hosts in (H)Shiloh. And the two sons of Eli, Hophni and Phinehas, were priests to the LORD there. 5but to Hannah he would give a double portion, for he loved Hannah, (J)but the LORD had closed her womb. 6Her rival, however, (K)would provoke her bitterly to irritate her, because the LORD had closed her womb. 7It happened year after year, as often as she went up to the house of the LORD, she would provoke her; so she wept and would not eat. 8Then Elkanah her husband said to her, "Hannah, why do you weep and why do you not eat and why is your heart sad? (L)Am I not better to you than ten sons?" 9Then Hannah rose after eating and drinking in Shiloh. Now Eli the priest was sitting on the seat by the doorpost of (M)the temple of the LORD. 10She, greatly distressed, prayed to the LORD and wept bitterly. 11She (N)made a vow and said, "O LORD of hosts, if You will indeed (O)look on the affliction of Your maidservant and remember me, and not forget Your maidservant, but will give Your maidservant a son, then I will give him to the LORD all the days of his life, and (P)a razor shall never come on his head." 12Now it came about, as she continued praying before the LORD, that Eli was watching her mouth. 13As for Hannah, (Q)she was speaking in her heart, only her lips were moving, but her voice was not heard. So Eli thought she was drunk. 14Then Eli said to her, "(R)How long will you make yourself drunk? Put away your wine from you." 15But Hannah replied, "No, my lord, I am a woman oppressed in spirit; I have drunk neither wine nor strong drink, but I (S)have poured out my soul before the LORD. 16"Do not consider your maidservant as a worthless woman, for I have spoken until now out of my great concern and provocation." 17Then Eli answered and said, "(T)Go in peace; and may the God of Israel (U)grant your petition that you have asked of Him." 18She said, "(V)Let your maidservant find favor in your sight " So the woman went her way and ate, and (W)her face was no longer sad. 19Then they arose early in the morning and worshiped before the LORD, and returned again to their house in (X)Ramah And Elkanah had relations with Hannah his wife, and (Y)the LORD remembered her. 20It came about in due time, after Hannah had conceived, that she gave birth to a son; and she named him Samuel, saying, "(Z)Because I have asked him of the LORD." 21Then the man Elkanah (AA)went up with all his household to offer to the LORD the yearly sacrifice and pay his vow. 22But Hannah did not go up, for she said to her husband, "I will not go up until the child is weaned; then I will (AB)bring him, that he may appear before the LORD and (AC)stay there forever." 23(AD)Elkanah her husband said to her, "Do what seems best to you Remain until you have weaned him; only (AE)may the LORD confirm His word." So the woman remained and nursed her son until she weaned him. 24Now when she had weaned him, (AF)she took him up with her, with a three-year-old bull and one ephah of flour and a jug of wine, and brought him to (AG)the house of the LORD in Shiloh, although the child was young. 25Then (AH)they slaughtered the bull, and (AI)brought the boy to Eli. 26She said, "Oh, my lord! (AJ)As your soul lives, my lord, I am the woman who stood here beside you, praying to the LORD. 27"(AK)For this boy I prayed, and the LORD has given me my petition which I asked of Him. 28"(AL)So I have also [a]dedicated him to the LORD; as long as he lives he is dedicated to the LORD " And (AM)he worshiped the LORD there. Because (AP)I rejoice in Your salvation. (AS)Nor is there any rock like our God. (AV)And with Him actions are weighed. (AX)But the feeble gird on strength. But those who were hungry cease to hunger. But (AZ)she who has many children languishes. (BB)He brings down to Sheol and raises up. (BD)He brings low, He also exalts. (BK)For not by might shall a man prevail. (BP)And will exalt the horn of His anointed." 11Then Elkanah went to his home at (BQ)Ramah (BR)But the boy ministered to the LORD before Eli the priest. We will be having our first Community Dinner this Wednesday, May 4th from 6pm to 7:30pm We will be having salad, spaghetti, and garlic bread. Everyone is welcome to come and enjoy this free for everyone dinner. We will be having Dinner and a Movie night Friday, May 20th. Come out and enjoy good food, a good movie, and most of all good Christian fellowship. and on a colt, the foal of a donkey.’"
"Now fear the Lord and serve him with all faithfulness. Throw away the gods your ancestors worshiped beyond the Euphrates River and in Egypt, and serve the Lord. But if serving the Lord seems undesirable to you, then choose for yourselves this day whom you will serve, whether the gods your ancestors served beyond the Euphrates, or the gods of the Amorites, in whose land you are living. But as for me and my household, we will serve the Lord." After the death of Moses the servant of the Lord, the Lord said to Joshua son of Nun, Moses' aide: "Moses my servant is dead. Now then, you and all these people, get ready to cross the Jordan River into the land I am about to give to them—to the Israelites. I will give you every place where you set your foot, as I promised Moses. Your territory will extend from the desert to Lebanon, and from the great river, the Euphrates—all the Hittite country—to the Mediterranean Sea in the west. No one will be able to stand against you all the days of your life. As I was with Moses, so I will be with you; I will never leave you nor forsake you. Be strong and courageous, because you will lead these people to inherit the land I swore to their ancestors to give them. "Be strong and very courageous. Be careful to obey all the law my servant Moses gave you; do not turn from it to the right or to the left, that you may be successful wherever you go. Keep this Book of the Law always on your lips; meditate on it day and night, so that you may be careful to do everything written in it. Then you will be prosperous and successful. Have I not commanded you? Be strong and courageous. Do not be afraid; do not be discouraged, for the Lord your God will be with you wherever you go." 10 Finally, be strong in the Lord and in his mighty power. 11 Put on the full armor of God, so that you can take your stand against the devil’s schemes. 12 For our struggle is not against flesh and blood, but against the rulers, against the authorities, against the powers of this dark world and against the spiritual forces of evil in the heavenly realms. 13 Therefore put on the full armor of God, so that when the day of evil comes, you may be able to stand your ground, and after you have done everything, to stand. 14 Stand firm then, with the belt of truth buckled around your waist, with the breastplate of righteousness in place, 15 and with your feet fitted with the readiness that comes from the gospel of peace. 16 In addition to all this, take up the shield of faith, with which you can extinguish all the flaming arrows of the evil one. 17 Take the helmet of salvation and the sword of the Spirit, which is the word of God. 18 And pray in the Spirit on all occasions with all kinds of prayers and requests. With this in mind, be alert and always keep on praying for all the Lord’s people. 19 Pray also for me, that whenever I speak, words may be given me so that I will fearlessly make known the mystery of the gospel, 20 for which I am an ambassador in chains. Pray that I may declare it fearlessly, as I should. Thanks to everyone who came out to the first ever LAN party hosted by New Beginning Baptist Church. We had about 17 people show up over the course of the evening (not too bad for or first try). 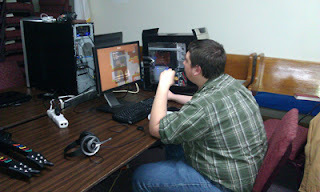 Thanks also to all of those who aided in the success of our first LAN party here at New Beginning Baptist Church. Check out pictures on our LAN party blog or click here to be taken straight to the post. 10 Finally, be strong in the Lord and in his mighty power. 11 Put on the full armor of God, so that you can take your stand against the devil’s schemes. 12 For our struggle is not against flesh and blood, but against the rulers, against the authorities, against the powers of this dark world and against the spiritual forces of evil in the heavenly realms. 13 Therefore put on the full armor of God, so that when the day of evil comes, you may be able to stand your ground, and after you have done everything, to stand. 14 Stand firm then, with the belt of truth buckled around your waist, with the breastplate of righteousness in place, 15 and with your feet fitted with the readiness that comes from the gospel of peace. 16 In addition to all this, take up the shield of faith, with which you can extinguish all the flaming arrows of the evil one. 17 Take the helmet of salvation and the sword of the Spirit, which is the word of God.18 And pray in the Spirit on all occasions with all kinds of prayers and requests. With this in mind, be alert and always keep on praying for all the Lord’s people. 19 Pray also for me, that whenever I speak, words may be given me so that I will fearlessly make known the mystery of the gospel, 20 for which I am an ambassador in chains. Pray that I may declare it fearlessly, as I should. 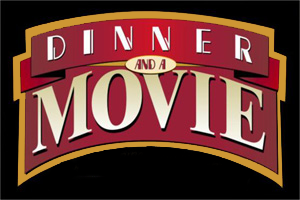 We will be having another dinner and a movie night this Friday, March 18th. Come on out and enjoy some good christian fellowship. Since easter is coming up soon, we will be watching The Passion of the Christ. New Beginning Baptist Church is happy to announce some of the new projects and changes we've been working on. We've replaced our pews with linkable chairs. These chairs are FAR more comfortable than the older pews and they are much easier to move around and stow away for events. The pews are now up for sale on Craigslist here. A very generous donation was made of a wonderful Frigidaire oven/range. With this new oven/range we plan to start a food ministry; feeding the public's body and spirit. In preparation for this food ministry, we've begun remodeling what used to be our nursery into a brand new kitchen. Our old kitchen (now the nursery) didn't have a sink and wasn't very conducive for feeding the masses. It was also harder for those accessibility needs to access because of the narrow hallway and sharp turns. Our new kitchen will have a sink, plenty of counter space and cabinets, and even a pass through to allow easy distribution of food. We've also been working on a new audio visual control center. This platform in the back of the sanctuary will allow those running our projection and sound system to more easily manage the equipment making them more effective tools for spreading the news of Jesus Christ. This will also allow easier management of recording equipment for recording the sermons on Sunday's (or anything else we wish to record). God has truly blessed us and is continuing to do so. He's giving us the tools to reach out and touch the lost, sowing seeds of his grace in their hearts. Thanks to all who have given to these projects not only in financial/materialistic ways but also with their hard work, diligence, and time. We are excited to announce the first ever New Beginning Baptist Church LAN party. The LAN party will be March 25th to 26th. We will be starting around 6:30pm however you can show up anytime after. We will be going until 5am on the 26th. For more information about the LAN party click here. So... What exactly is a LAN party you may ask. 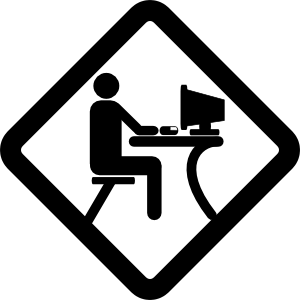 A LAN party is a temporary, sometimes spontaneous, gathering of people with computers, between which they establish a local area network(LAN), primarily for the purpose of playing multi-player computer games (more information here). Tickets on sale FRIDAY FEBRUARY 18th, 10:00AM at all Ticketmaster outlets, including all Louisville Kroger Stores. 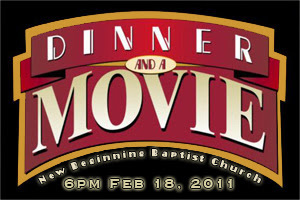 On February 18th we will have our first Dinner and a Movie Night for 2011. Come out and enjoy good food, a good movie, and most of all good Christian fellowship.